What is the most challenging experience you had to go through in your household? Naturally, I expect an honest answer. Trust me, compared to tolerating a squeaky ceiling fan, looking after kids is as easy as pie! That’s not even the beginning of the problem. The problem starts when the fan goes really, really bad. Good luck dealing with the noise and then, the lack of air. I saw Robbins, my neighbor, tossing out his fan out of anguish the other day. He’ll probably buy a new one soon. Frankly, looking for the ideal fan will cost him time and money (a lot of it)! It is at these times when I wish I could teach him how to fix a noisy ceiling fan. Thankfully, with this article, I have the chance to teach that to my readers! But first, let’s discover the causes that make a fan squeaky as hell! 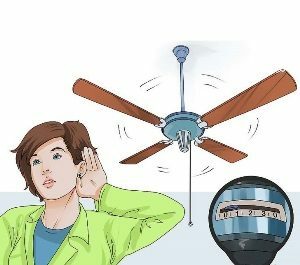 What Makes Your Ceiling Fans Do Weird Noises? I hate to say this, but the possibilities are endless. A number of reasons might cause these devices to act up and squeak in the middle of the night. I came up with five primary causes of annoying sounds that I’m willing to discuss a bit with you. Sometimes, the fan in question might make a humming noise. It is the most common problem that folks face at home. This is due to the “Dimmer” controls that are used to keep the speed levels of your fans in check. Another cause of the humming may be the remote you are using. However, remotes aren’t the source of the problem. Instead, you’d do well to check the capacity of the receiver. These things can’t receive the signals from the remote at times and cause the fan to act in a weird way. Sometimes, the cause of the noise might be more serious than that of a “Humming” sound. It is entirely possible that the screws that connect your fan’s different components with each other, are loose. Then, the device will make a rattling sound. People often mount their accessories directly to the joist. If the fan has pre-existing noises and squeakiness, they amplify three or four times. If a person is unlucky, he might hear grinding noises in the middle of the night. Beware, the flywheel might be at fault. Now that we know the core reasons behind a squeaking fan, we can counter them by taking some countermeasures and regular maintenance. These can be classified into eight different steps to a solution or eight solutions to the noise problem depending on how you handle it. So, let’s begin! This is the simplest of approaches one can take to eliminate the noises. Take a cleaning solution and a damp cloth. 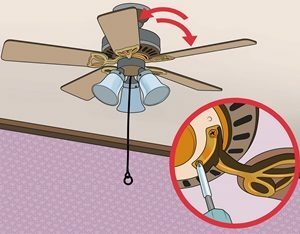 Unscrew every part of your fan and bring it to the ground. Then, clean the body and the blades using the cleaning agent. Make sure the cleaning apparatus itself is clean. You’ll do well to buy one with no odor. Check if you are allergic to what you are using. Turn the power off at first. You’d need a “Step Ladder” for the job. 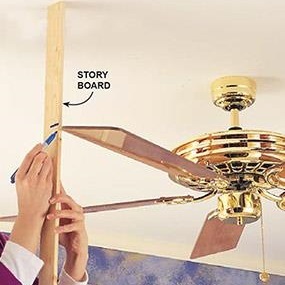 Get on the step ladder and inspect the top and sides of the blades of your fan. Get up there with a screwdriver. The first thing I’d do is checking the screws for tightness. Do a bit of wiggling to see if the blades are loose. Loose blades are the main cause of a rattling noise as you know. The way to stop the noise is to tighten these screws in place with a screwdriver. While you are at it, check how these things are connected with the brackets or motor. If you find any loose ends, you know what to do. Now, if your accessory uses a “Phillips” screw, it is already larger than conventional ones. Pay attention to the size of the screws and choose screwdrivers accordingly. I’ve seen people use wrenches to get the job done too! 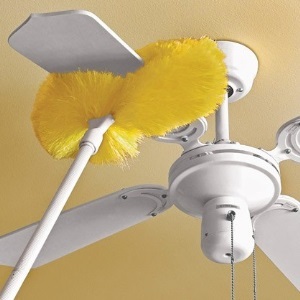 Humming and rattling of the fan can occur when the blades are tilted in one direction. Sometimes, old fans can have tilted blades (thanks to dust, rust, and longtime use). Tilted blades often have too much weight in one direction and can weigh your fan down as a whole. When it happens, it’s time to re-balance the accessory. I use the “Balancing Kit” to sort the situation. Don’t worry, you’ll find one with most of the new models out there. If someone doesn’t have it, he/she should seek refuge in a hardware store. These things are simple to use. What you have are some clips. Turn off the fan. Put them on a particular blade and move them around. Turn it on and check how it moves. If the noise is gone, congrats! You’ve found the culprit blade. If not, change the position of these clips and repeat the process. One May Have to Change the Capacitor or the Motor Itself! Besides rattling and humming, the fan can sometimes sound like a sizzler on fire. People might even see steam coming out of the fan (this is serious guys)! If someone notices an odor, that’s a bonus! This is when you KNOW the motor’s acting up. Unscrew everything. Check if the poor capacitor is doing okay or not. It’s probably the latter. You need to change the capacitor ASAP. Check the voltage count of the new capacitor with the old one. You don’t want to miscalculate and blow the whole fan up in your face. There was one time when my neighbor heard grinding noise (like that of the coffee machine gone bad). This is due to the sagging flywheel or materials scraping off the motor’s surface. Or, simply, the flywheel is broken altogether. If this is the case, change the motor altogether. Wait, we’re discussing how to fix a squeaky fan, right? Why bring the light fixtures into this? Well, my friends, these products are often wrapped within a rubber band that keeps the housing separate from the metal flanges. Once the rubber band is out of its designated place, one might hear squeaking. This is the time when you need to check the globe (or globes) for any dust. If people find any, they will have to clean it. While people are at it, they should tighten the screws also. One should “Finger Tight” the screws. Don’t put too much pressure as it can backfire on you by rendering the kit unusable. My Remarks at the End! Majority of us don’t know how to fix a noisy ceiling fan or simply procrastinate when it’s “That Day” of the month. Once you get to know the procedure, it becomes super-easy. This little attempt of mine will surely help many of my readers in discerning what type of noise they are hearing and act accordingly. Whatever approach you take at the end, make sure to keep “Safety” in mind.